Bunny Art Activities for preschoolers through second grade. To make a personalized bunny picture all your students need is some paint and their hands! Paint the palm of one hand with desired paint, then separate fingers into a “V” (like the Star Trek Vulcan hand sign!) with the thumb held up next to forefinger then middle finger – then space – and the ring finger right next to the pinky. Then place their hand, still in the “V” on the paper. 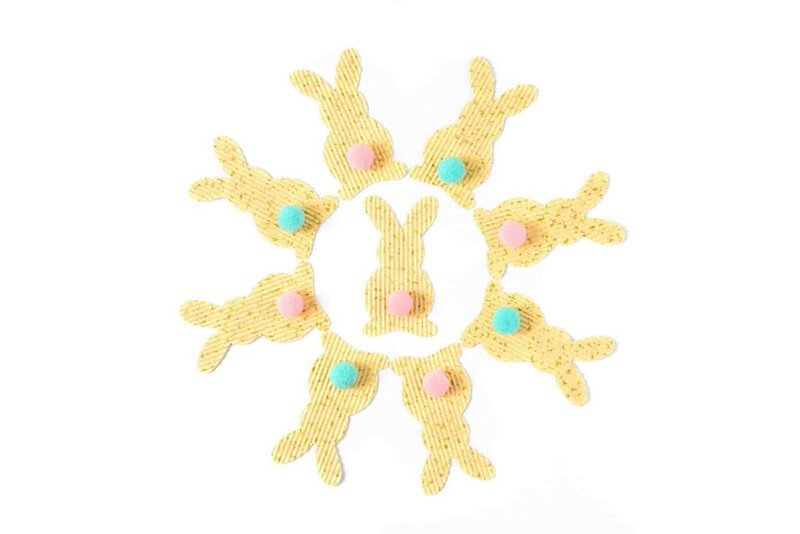 When dry decorate like a bunny face with pipe cleaner whiskers, googly eyes… Fun and personalized! I let the kids glue white cotton balls onto paper plates and add large wiggle eyes, pink pom pom for the nose, construction paper teeth and ears made with white poster board and pink felt in the middle…really cute for bunny week! Take a white poster board and cut into two large oval shapes and then cut 2 ears, 4 paws and a tail. Take each piece and have the children finger paint each piece whatever color than choose. Then when dry have the children paste felt eyes, nose, mouth and pipe cleaner whiskers on. Then assembling by gluing or pasting all the bunny together. Maybe a 2-day project. Also cut to smaller earpieces out of felt for the middle of the ears and paste. Then do a large oval felt piece for the tummy. For the tail Use a large pom pom. Use “bunny-food” to create a bunny. Dip a carrot long ways in paint then press down on to paper to make bunny ears. Then cut the bottom off the carrot dip in paint and press on paper to make 2 eyes and a nose. Then dip the top of the carrot in the paint and use the point to draw a mouth. Pre-cut a bunny out of good construction paper. Make sure if you’re going to be using white shaving cream/paint, that your bunny is a different color so the kids can see what they’re creating. With a marker, add any features that you like to your cut out. Next, mix any kind of cheap shaving cream with either powdered tempra, or a little pre-made paint. Give the kids the bunny and the “paint” and let them go. They can use a brush, or their hands to paint the bunny. I teach PreK and my children love to paint. I have found an idea to help my students feel like a real artist and get into the spring spirit. What better way than Big Stuffed Rabbits. I put them everywhere in the room even in the art center. The children love to look and paint the rabbits. They even talk to them. Cut a large circle out of the center of the paper plate. It needs to be large enough for the child’s face to show through. Let the children glue cotton balls around the frame of the paper plate. Have each child make footprints using the tempera paint on construction paper. Cut out the footprints and attach them to the top of the paper plate for bunny ears. Voila!!! A bunny mask or frame!! The children could use them for dramatic play or during music and movement time. You could also take a picture of each child’s face and put it in the center of the bunny frame. Be creative! !